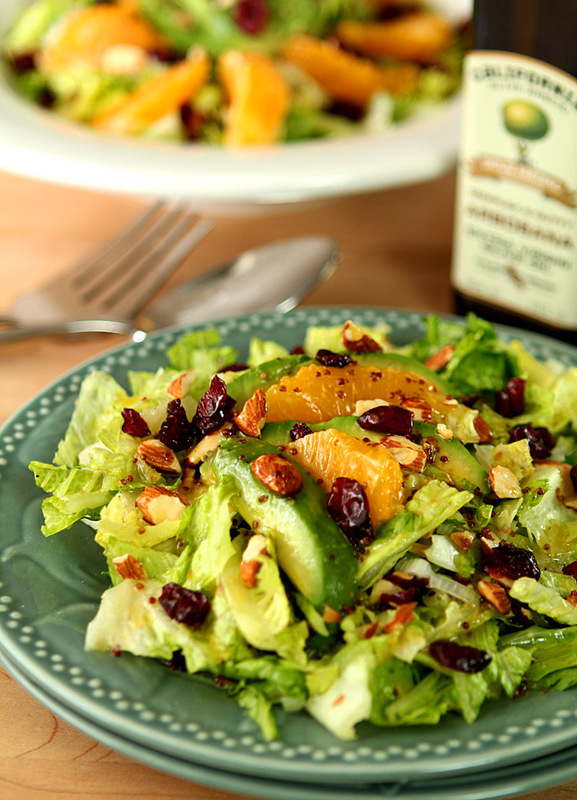 Here, Kiebel pairs the dressing with an avocado and orange chopped salad. The salad also includes romaine lettuce, candied almonds, dried cranberries and green onions. Speaking of salads and dressings, we asked Kiebel for tips for making your own. When making a salad dressing, do you have a preferred ratio of extra virgin olive oil to vinegar? Typically thee parts oil to one part vinegar. What types of vinegar do you like to use in your dressings? Balsamic vinegar is my favorite; but I use red wine and cider vinegar too. What are some easy ways – i.e., herbs, spices, etc. – to boost the flavor of a salad dressing? I think the best boost is to add some chopped fresh herbs. They’re always available now in the vegetable section of the grocery. I use rosemary and/or garlic with a quick sauté to flavor olive oil. But I add most others fresh: chives, basil, and thyme are favorites … and easy to grow too. What are some of your favorite things to add to a basic green salad – i.e., vegetables, nuts, seeds, etc.? I am going nuts over salads with berries: strawberries, raspberries and blackberries, primarily often mixed with citrus (oranges, blood oranges, tangerines, grapefruit). They’re great with walnuts, pecans, sunflower seeds and pine nuts and some grated cheese. Depending on the time of day and the hunger pangs I’ll also add some grilled chicken. FAVORITE dressing right now is the one I’m blogging about: a mix of honey, mustard and olive oil with some orange and lemon juice. Can you briefly describe your favorite grain salad so that our fans could replicate it in their own kitchens? What’s your favorite go-to salad that people might be able to make on their own? The fruit salad I mentioned. For example: lettuce, raspberries, toasted pecans, goat cheese and a simple olive oil and balsamic vinegar dressing. I often just look in the fridge and see what I’ve got. If I have the lettuce and some cheese, I can always find something to add to them and make a great, simple salad. Experimenting is good!